As regular readers of this blog know, I started a camera-trapping project here in Bell County in June of last year. I’ve chased mountain lion reports from one end of the county to the other. I have yet to capture a photo of one of these elusive big cats but remain hopeful. There continue to be periodic sightings of a cougar in the general area around my camera locations but things seemed to have slowed down quite a bit. It is possible the big cat has moved on. While not getting that cougar photo to this point, despite sightings very close to my camera locations, has been frustrating, the project has not been a failure. As is often the case with these sorts of things, something very good has come out of it…just not the good thing I targeted in the beginning. would be interested in viewing the photo." “Not too much doubt what you are looking at in the photos – probably a mother and a youngster. Would you mind taking a moment to give me a location of the sighting – it doesn’t have to be specific just something like “where Rocky Road crosses Sandy Creek” would be fantastic. That will give me enough information to plot the sighting." 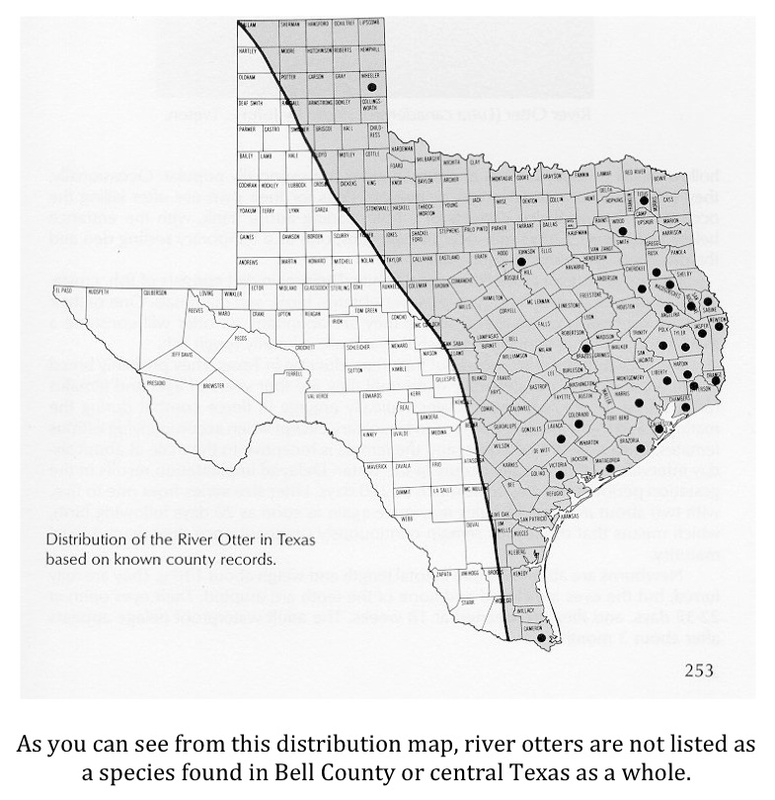 To make a long story a bit shorter, because of my photo, the distribution map for the river otter will be changed to reflect the presence of the species in Bell County. The timetable on when this will take place is not clear but it will happen the next time the map is updated. 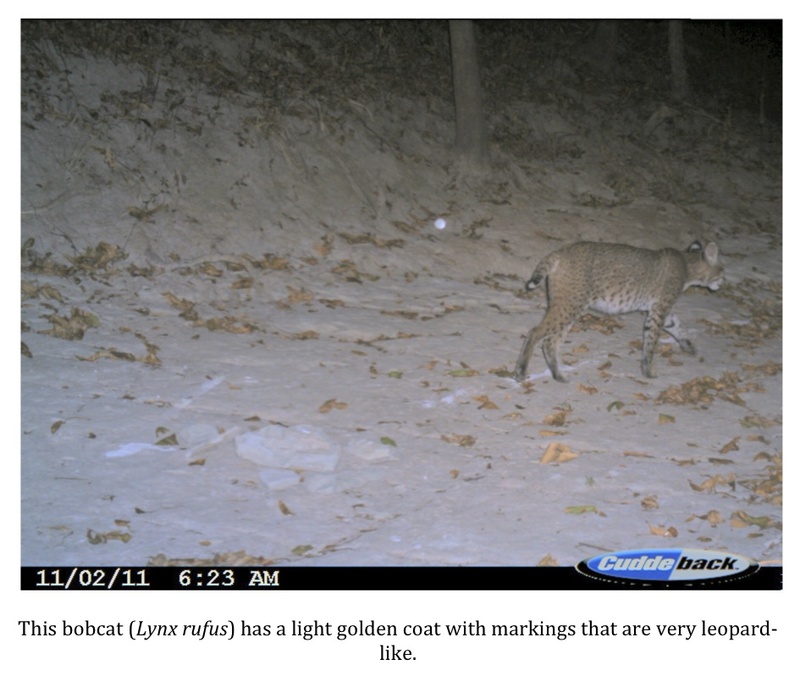 The documentation of a known species a few counties west of where it is supposed to be may not seem like an important discovery but it is actually kind of a big deal in wildlife circles. I am very, very pleased by this turn of events and think it really shows that even an amateur naturalist, with extremely limited resources, can accomplish some pretty cool things. 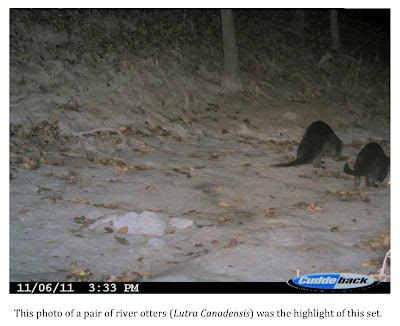 So, a project that got started, and continues, with the hope of getting a photo of a mountain lion has reached its high point with an accidental photo of a pair of river otters. I wanted to take a moment and wish everyone a Merry Christmas. It is my prayer that you all have a blessed holiday and a prosperous and peaceful new year. I look forward to what the new year may bring. "If I trim myself to suit others I will soon whittle myself away." I try to keep this quote in mind when others give me a hard time about my interest in cryptozoology and other "non-mainstream" topics. I am who I am. I may not be the one who solves the sasquatch mystery but it will be someone a bit like me. Someone who shakes off the ridicule and vitriol directed at them by those who spend life on the sidelines and stays true to himself. Someone who shakes off negativity and naysayers to do what they say couldn't be done. Someone who, even when it was tough, did not whittle themselves away to suit others. 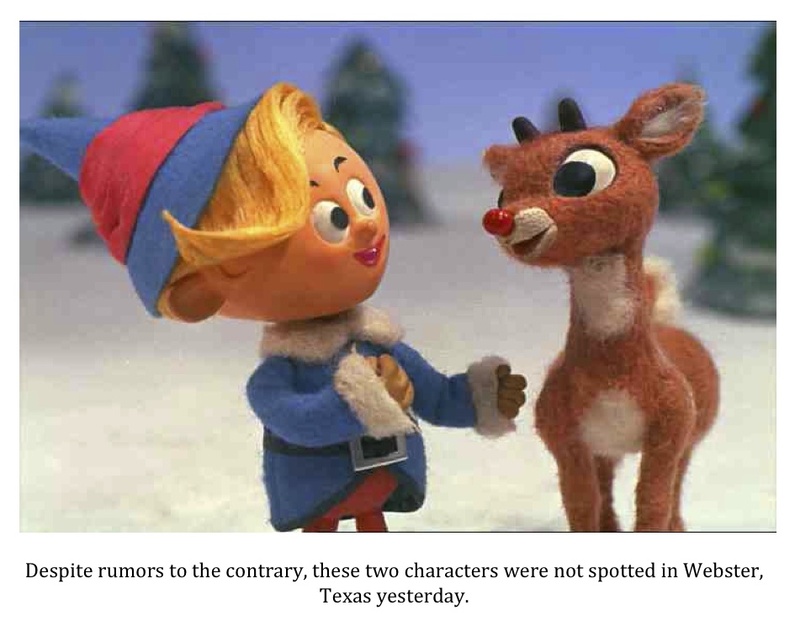 If you live somewhere along the I-45 corridor near Webster, Texas and your child comes home and says that he/she saw Santa’s reindeer running down the road…believe it. Well, they weren’t Santa’s reindeer (as far as I know) but there were reindeer dashing about on and near I-45 yesterday. It seems a petting zoo was transporting a couple of its reindeer when the trailer in which they were being towed came loose from the truck. Somehow, the door to the trailer came open and the two reindeer made a run for it. Webster police, after fielding several calls from surprised local residents regarding the reindeer, dispatched several units and helped round up the runaways. Neither the reindeer nor anyone else was injured during the incident. Santa Claus didn’t come to town (it’s not time, after all) but a couple of reindeer did. I guess it is just that time of year. 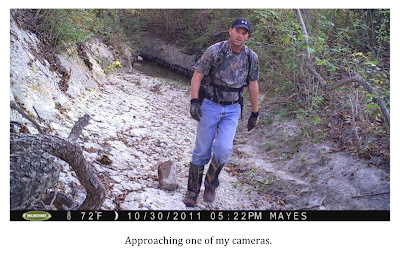 I was finally able to get out and check my game cameras here in Bell County this past weekend. I was over a week past due on checking them due to inclement weather and a bad cold. I have to admit that I’m a huge sissy when it comes to colds. Any sort of injury I can handle ok. Sprains, strains, contusions, broken bones…I’ll handle them. A bad cold? I’m done. In any case, the skies cleared up, the water ran off, and I started to feel better so I got out and got it done this past weekend. I’m glad I did. I again failed to capture an image of the mountain lion(s) that have, until recently, been spotted on a regular basis in eastern Bell County. Even so, I was able to retrieve more than 700 quality images from 3 of the 4 cameras. I say 3 of 4 because the bungee chord holding up one of my two Cuddeback cameras snapped shortly after deployment. I have a security chain on the camera that kept it from falling into the creek bed but it did fall down to the base of the tree and somehow got twisted so that it faced the trunk. So, nothing of value was captured on that camera. The other three cameras (Cuddeback Excite, Moultrie M80 GameSpy, Wildgame Innovations IR2) all performed very well. The Moultrie captured a few interesting videos as well as getting some nice photos. At some point, the camera was twisted and shaken by an unseen animal. I’m guessing it was a raccoon. 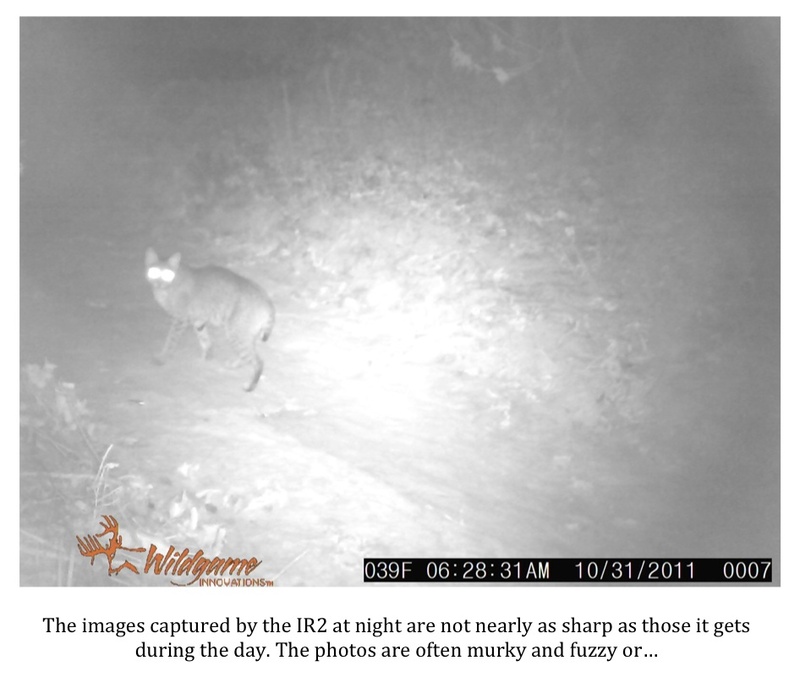 Easily 2/3 of the pictures taken were of raccoons which makes one of them a likely culprit. I would add that this is exactly the sort of video some people would put forth as evidence of a sasquatch tampering with the camera. Many would say no other animal was capable of shaking and shifting the camera in such a manner. So, keep my little video example here in mind the next time you see a similiar clip and it is offered as indisputable evidence of sasquatch behavior. Despite the camera being shifted and moved around it continued to get some nice shots. This camera is programmed so that when triggered it snaps a photo. It then immediately begins taking video. One video was a great insight into the behavior of whitetail deer during the rut. 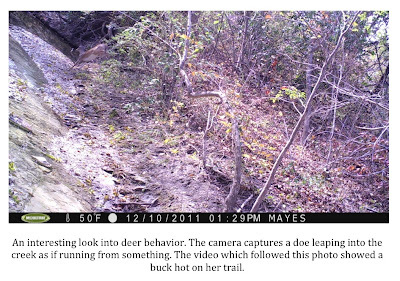 The camera captures a fully airborne doe leaping into the creek as if something was chasing her. The video, which started immediately after the photo was taken, shows a buck trot up, sniff the air, and then proceed to follow the object of his desire. Whether she ever decided to cooperate or not I cannot say but the video is exactly the sort of “behind the scenes” look you can get with a game camera. I love seeing clips of even the most common animals behaving naturally. I find it fascinating. The Wildgame Innovations IR2 is easily the least expensive camera I have in the field. It actually performs pretty well. The photos it takes during daylight hours are very, very good. The nighttime shots, when most of the action takes place, are, unfortunately, not nearly as sharp. The sensor detects movement at an acceptable range but the flash is too weak to light these targets up sufficiently. The result tends to be shots that are murky and not sharp if the subject is on the periphery of the sensor range or washed out images if the subject is close to the camera. 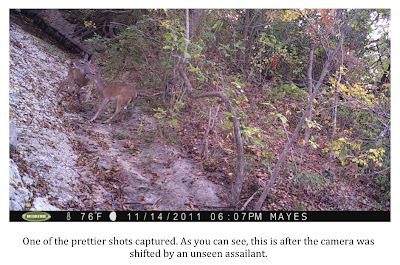 I was especially pleased with the performance of the second Cuddeback Excite camera. As I’ve mentioned before, this is an old veteran of the TBRC’s Operation Forest Vigil. It has been an old warhorse for a long time now. One of the great things about this camera is that it takes color photos at night. This capability produced one of my favorite shots of the set when it captured an unusually reddish-colored coyote. 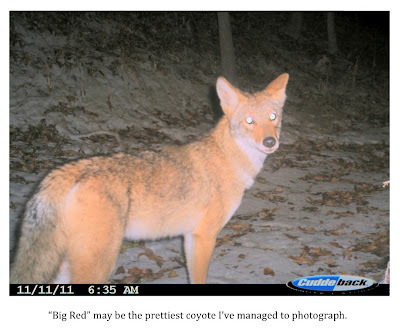 He is quite striking and his coloration stands out starkly when compared to a more typically colored coyote that was also photographed. 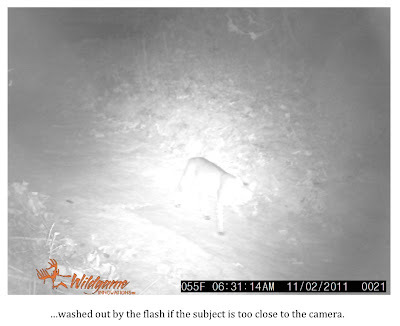 The Cuddeback captured the widest variety of animals of any of the three cameras this time around. Included were the pictures below showing a black opossum and a striking bobcat with a very leopard-like coat. I checked the distribution map provided as well and found that, according to known county records, no river otters have ever been documented in Bell County. All of this being the case, I got very excited about this photo. Could these be the first river otters ever documented in Bell County, Texas? 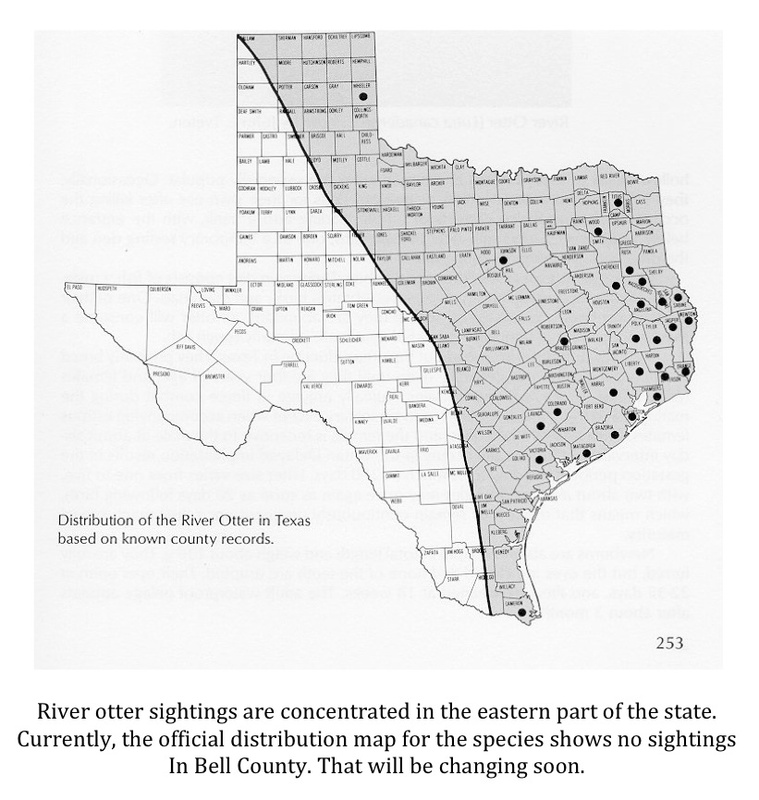 Short of that, could this photo prove that otters, once extirpated from central Texas, be rebounding? Well, maybe. I have been informed that unless an actual specimen has been taken from a county, a species is not considered “documented” there. 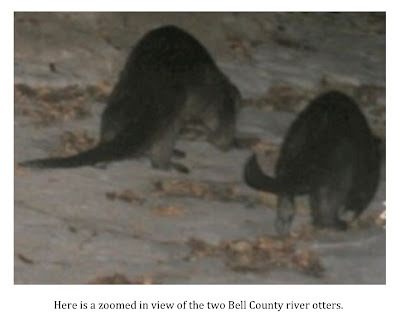 In other words, river otters may have been seen, possibly even photographed, in Bell County before but since no one has trapped or shot one and presented the body as proof to the Texas Parks & Wildlife Department the species is not considered to be present. 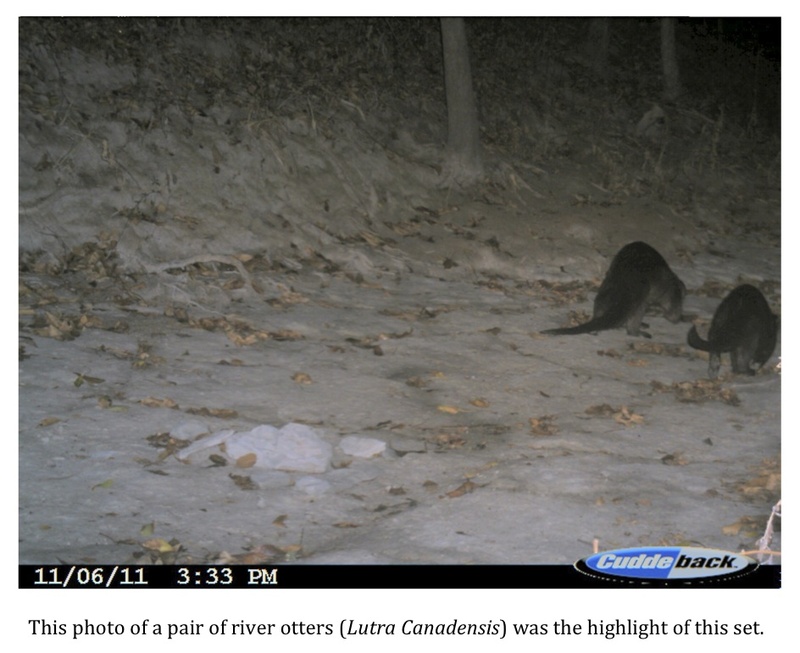 I submitted the photo to several biologists who all have confirmed that the subjects in the photo are river otters. 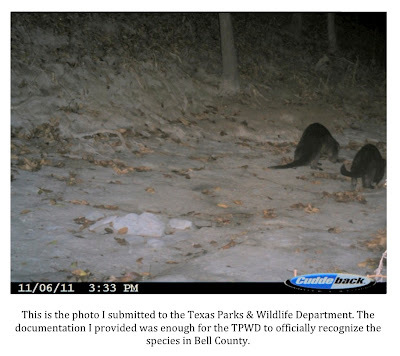 I also sent an email to the Texas Parks & Wildlife Department explaining that I had a photo of river otters taken in Bell County and asked if they wanted to view the photo. I sent the email Sunday night. It is now Wednesday night and I’ve heard nothing back from them as of yet. If I don’t hear back from them in the next couple of days I’ll contact the local office in Temple. Regardless of whether this photo will officially “document” otters in Bell County, I feel very fortunate to have captured it. Otters, at best, are very rare in this part of the state and I think it is an incredibly cool addition to my wildlife photo collection. There was some bad news. The Cuddeback that took these great shots was a victim of rising water after several storms blew through the area a couple of weeks ago. The camera was never completely submerged but some moisture did get into the camera causing the lens to fog up. While the camera still showed power, no photos were taken after the flooding event. I feel very fortunate that the compact flash card was not ruined. Currently, I am attempting to dry the camera out. Once it is dry and cleaned of mud I’m hopeful it will continue to function. Even though the big prize that would be a mountain lion photo eluded me again, I feel very good about this last set of photos. I remain hopeful that I will eventually get a shot of one of these big cats. Even if I don’t the otter photograph proves that you just never know what you might get a picture of if you are patient and allow cameras to sit undisturbed for long periods of time. I’m due to check the cameras again in 4-5 weeks. The following article originally appeared on the website of the Texas Bigfoot Research Conservancy and is reprinted here with permission. In Texas, Oklahoma, Arkansas and Louisiana, anecdotes about huge, hairy, apelike creatures said to dwell in the deep woods and, occasionally, near the peripheries of rural communities, have accumulated for centuries. Many of these accounts were related by highly reliable and trustworthy individuals, people who had nothing to gain by telling their stories. Indeed, in many cases, these witnesses became the subjects of much ridicule, even among close friends and relatives. To the present day, most witnesses hesitate to share their incredible stories of seeing this strange, undocumented animal. Their reticence should come as no surprise given the treatment of the subject by the mass media and some mainstream scientists. There are many skeptics; their concerns are legitimate. Skeptics demand to know why no skeletal remains have been found; they want to know why no hunters have killed one, or why no driver has collided with one on a secluded country highway. Would not a large primate, skeptics ask, leave an undeniable, discernable mark on the environment in perhaps the same manner as mountain gorillas (Gorilla gorilla beringei)? Such questions are not invalid. Expecting skeptics to accept the likelihood of such a species existing beneath our proverbial noses may be asking just a tad too much. Nevertheless, the body of anecdotal accounts and accompanying evidence seems to indicate just such a possibility. Contrary to what some may assert, most hunters do not generally shoot at anything other than their intended game. While there are exceptions, most hunters will definitively identify their targets and normally just do not shoot at unknown or unidentified prey. That said, there have been a few scant reports of sasquatch shootings; most were relayed through second hand sources. Further, most of those few reports that were related to shootings indicate that the shooters either missed or did not immediately bring the fleeing sasquatches down. Skeletal remains are rarely found of any common, large, wild animal, so it should not be surprising that the skeletal remains of a sasquatch are not readily available. The acidic forest soils and muddy river bottoms found in the preferred habitat for the sasquatch tend to work in tandem with scavengers to quickly eliminate the remains of deceased animals. Finding a cougar (Puma concolor) carcass as a result of a natural death would probably be most analogous to finding a sasquatch carcass, although the most conservative estimates of cougar population densities most certainly are far greater than even the most liberal estimates of sasquatch population densities. There have been a few unsubstantiated reports of near misses of sasquatches by drivers, and given the probability that many encounters go unreported, it is possible that a sasquatch could have been hit and killed by a moving vehicle. However, realistically, given the probable rarity of these creatures along with their intelligence and caution, the odds of such an event occurring seem almost non-existent. There are some discernable signs that possibly indicate the presence of sasquatches (thus the noticeable effect on the environment), however, the signs are easily disregarded by someone unfamiliar with purported sasquatch behavior. For example, there are numerous reports of bigfoots breaking branches, trees, and saplings, and to a lesser degree, constructing nest-like structures. Tree damage, possibly done for the purpose of marking trails or territory is discernable, but oftentimes hardly stands out among deadfall and ice or wind-broken trees. Most people would miss or casually dismiss such signs. It is unlikely that a typical wildlife biologist or anyone not knowledgeable on this subject, upon observing sasquatch-related limb breaks, would ever suspect a sasquatch as the culprit, even in the absence of any other readily apparent explanation. The characteristic twisting accompanying such breaks would appear to require enormous strength that can only be accomplished by something with hands. Nest-like structures, purportedly built by sasquatches, have been found by researchers in areas of sightings. Another contention often heard is that the thousands of credible reports from throughout North America are, in one way or another, the products of human imagination. The contention is that many of the witnesses are intentionally lying about what they encountered and are actually themselves the perpetrators of hoaxes, or the witnesses are simply mistaken and are misidentifying what they saw or heard. Or, as the argument goes, many of the witnesses are simply victims of practical jokes and/or hoaxes. All evidence aside, it may seem more plausible to consider that there actually is an undocumented animal that is prompting thousands of reports than it is to believe in an unrelated series of hoaxed sightings and misidentifications. It should soon become evident to anyone who seriously and objectively delves into and studies the numerous credible sightings that many of the reports themselves are quite compelling. It is difficult to totally dismiss as fabrications all the reports that have accumulated from so many credible witnesses over so many decades. However, the essence of the research presented here does not focus on the validity of any individual report, but on the body of reports as a whole in order to ascertain any correlations and patterns that may exist. When one impartially studies the sum total of all the reports it becomes evident that there do indeed seem to be correlations and patterns that could be representative of a living species. Among these correlations, particularly in Texas, is the likelihood of sighting reports in areas with certain amounts of annual rainfall. The same pattern is also evident in the body of reports that originate in other states where there are divergent rainfall totals in different parts of each state, such as Oregon, Washington, Oklahoma, New Mexico, Montana, Colorado and California. (Conversely, in states with widespread abundant rainfall totals, such as Arkansas and Louisiana, a rainfall total/reported bigfoot encounters correlation is not evident). There is also a pattern of reported sightings along rivers, creeks or lakes. Reported sightings and human population densities seem to have some correlation, as does the distribution of alleged bigfoot sightings and areas viewed as suitable black bear habitat. John Green, journalist, author and renowned sasquatch researcher, first touched upon the association of reported sasquatch sightings and annual rainfall totals in his 1978 book Sasquatch: The Apes Among Us. Though the book was written nearly thirty years ago, the passage of time has not diminished its relevance. On the contrary, the increase of credible reports since that time has served to further validate Green’s thesis. He determined that eighty percent of the reported sightings and alleged footprint finds in North America occurred in areas receiving more than seventeen inches of annual rainfall. When this observation is applied to credible Texas reports and is represented on a map, discernable patterns seemingly indicative of a living species emerge. In Texas and Oklahoma, roughly ninety percent of the credible reports occur in areas that see at least thirty-five inches of rain per year, or in the eastern third of the state(s). 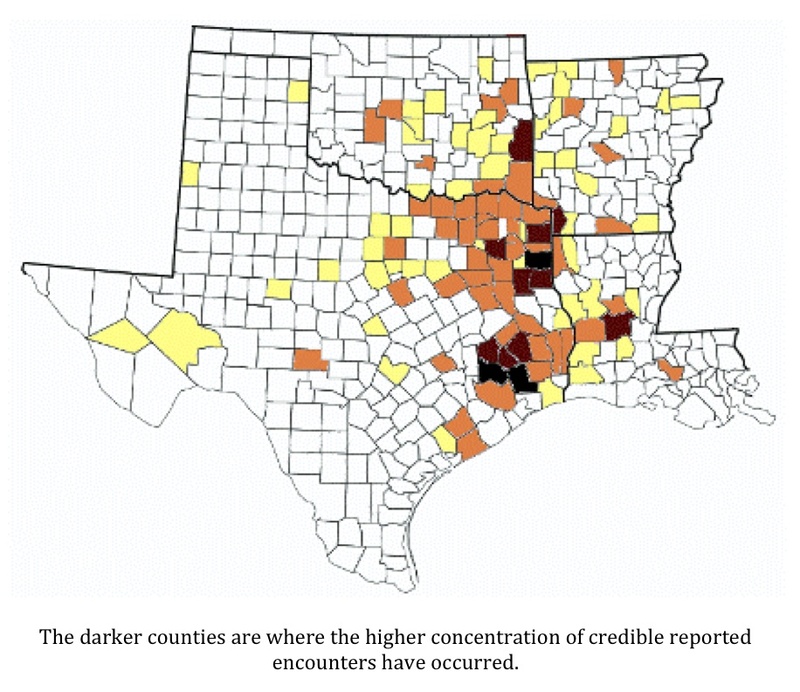 Since the vast majority of Texas and Oklahoma reports are aligned with rainfall patterns, it is possible to dispute allegations of fabrication or mistaken identity. It is not rational to assume or propose that people living in areas with more than thirty-five inches of annual rainfall are more likely to submit a hoaxed report or misidentify what they saw than people living in areas with less than thirty-five inches of annual rainfall. While a few reports have originated in areas with lower amounts of rainfall, they appear to be sporadic and isolated, possibly due to a natural propensity of wildlife to use watercourses as travel routes; if the sasquatch is a legitimate species, it makes perfect sense that it would also use watercourses as travel routes. While portions of far western Texas and Oklahoma are certainly semi-arid, the eastern sections of both states receive abundant annual rainfall. These areas are heavily forested and feature an abundance of waterways and lakes; they are very much ecological clones of the two neighboring eastern states of the region, Arkansas and Louisiana. The combined total amount of forestland in the four-state region equates to roughly 65,000,000 acres, or 100,000 square miles (the size of the state of Oregon). According to The Online Handbook of Texas, there are roughly 22,000,000 acres of forest in Texas alone; per the Arkansas Forestry Association, there are roughly 19,000,000 acres of forest in Arkansas; the Louisiana Forestry Association reports that there are 14,000,000 acres of forest in Louisiana; Oklahoma has approximately 10,000,000 acres of forest as indicated by the Oklahoma Department of Agriculture, Food and Forestry. While the forestlands of Texas, Arkansas, Louisiana and Oklahoma may be somewhat more parceled, or discontinuous, than northwestern forests, it is obvious that they are enormous in scope and depth, contrary to the misperceptions of some. Wildlife biologist Dr. John Bindernagel, who visited the region in 2001 and 2002, was struck by the richness and scope of the region’s forests, which are predominantly mixed deciduous, as opposed to the largely coniferous forests of the Pacific Northwest. Dr. Bindernagel recognized the value and productivity of deciduous forests in terms of wildlife habitat and he pointed out that large species of mammals living in the southern forests would almost certainly require smaller home ranges than in northern coniferous forests. Almost without exception, reported sasquatch sightings occur near water. This is even true with the relatively few reports originating in the drier regions of Texas and Oklahoma, where sasquatches are reportedly seen generally on or near waterways or lakes in thick brush or dense riparian vegetation. Most wildlife researchers and hunters would quickly reinforce the observation that many mammalian species often use rivers and creeks as travel routes. Since water is essential for the cycle of life, animals regularly congregate near or at least dwell primarily in areas featuring bodies of fresh water. Both Texas and Oklahoma have an abundance of rivers, creeks, swamps, reservoirs and lakes, particularly in their eastern regions. It is also reasonable for a large number of reported sightings to occur in or around swamps, river bottoms or bayous, since a reclusive, shy animal would find seclusion and sanctuary in such areas. When a river basins map is viewed with an overlay of reported encounters and an annual rainfall overlay, it becomes evident that most alleged sightings have occurred along waterways and lakes and in areas with thirty-five inches or more of annual rainfall. Many reported sightings in Northeast Texas have occurred in the Red River Basin along the Sulphur River or Red River and/or their adjoining reservoirs or creeks. Many reported encounters have also occurred in the Red/Sulphur River watershed in southeastern Oklahoma, southwestern Arkansas and Northeast Texas. Similarly, the Sabine River Basin, extending from Southeast Texas into Northeast Texas has also generated quite a few reports. 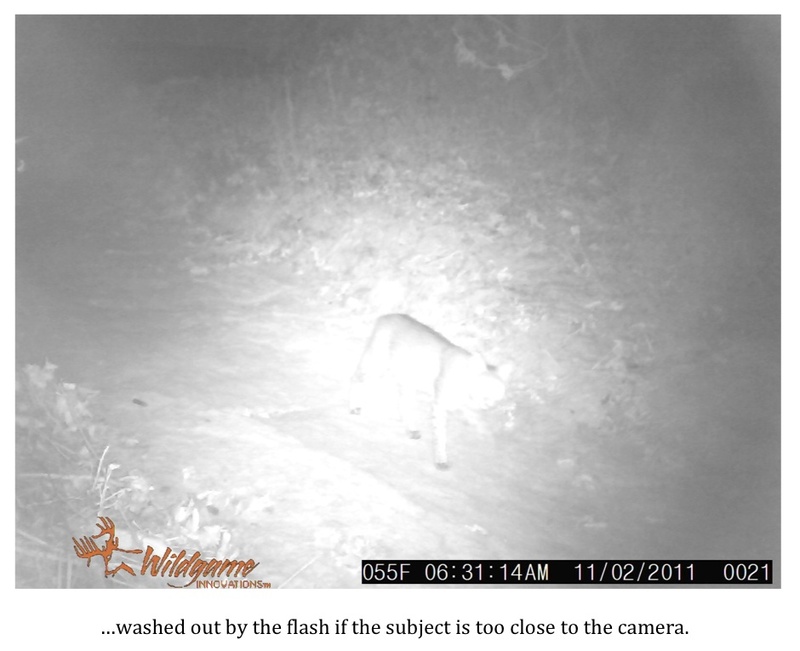 In Oklahoma, the Canadian River Basin is not without its share of reported encounters. In Southeast Texas, in what is called the Primitive Big Thicket (encompassing the Sam Houston National Forest and the Big Thicket National Preserve area), the Neches River Basin, Trinity River Basin and San Jacinto River Basin have had many reports through the years as well as in recent times. In fact, Southeast Texas is the most prolific area in Texas for reports of bigfoot sightings. Likewise in Oklahoma, the most prolific area for reported encounters is also in its southeastern region. 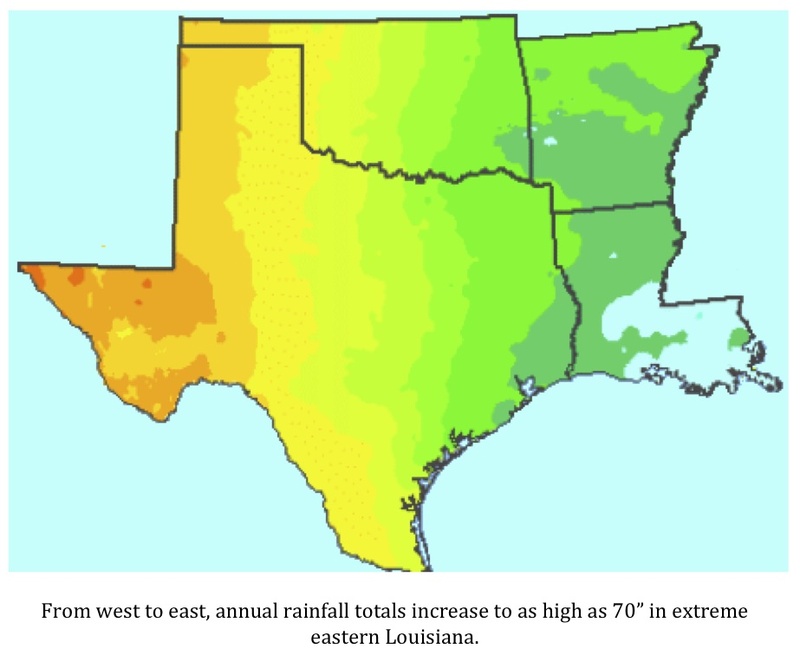 It should come as no surprise that the southeastern regions in both Texas and Oklahoma also receive the highest amount of rainfall for both states, with totals as high as sixty inches per year in spots. Although the East Texas river basins have generated far more reports, the Brazos, Colorado and Guadalupe basins have also had occasional reported sightings. These three basins average less than thirty-five inches of rainfall per year, but they typically have dense vegetation and trees in the riparian margins. Given that the vast majority of Texas and Oklahoma reports follows rainfall patterns and occurs along waterways, the notion that these reports are simply the result of the misidentification of known animals, wishful thinking, and/or deliberate fabrications seems flawed. There is yet another interesting correlation with the distribution of these sighting reports. For the most part it appears that most reported sightings in the four-state region occur in counties with lower human population densities. There are a few exceptions. 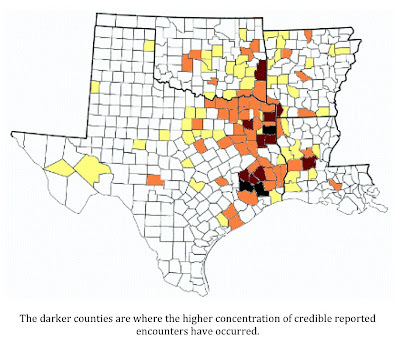 However, 100% of the sightings reported from counties with higher populations still occurred in areas that were along the peripheries of or outside of the realm of human development (such as in Montgomery County, Texas, in the Sam Houston National Forest, an area of consistent reports). Actually, suitable wildlife habitat often exists close to urban and suburban areas. That being said, reported sightings that have occurred on the edge of small towns and larger cities are by far the exceptions. In fact, it seems that where human populations increase, reported sasquatch sightings decrease. Where human populations decrease, reported sasquatch sightings may increase. The reputed shyness of the sasquatch is only further girded by this human population correlation. This observation is further enhanced by the inference from reports that sasquatches are nocturnal, or at the very least, crepuscular. Not only do the reported sightings seem to suggest that sasquatches live in areas of low human population densities, along waterways, and in areas of high annual rainfall, but they may be most active when humans are not, which is at night. The notion of fabrications and mistakes is unrealistic in light of these correlations. 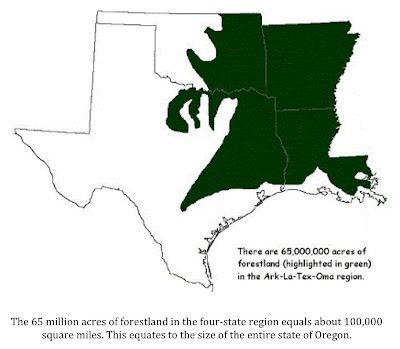 While Oklahoma, Arkansas and Louisiana have resident populations of black bears (Ursus americanus), there remains the question of whether or not the 12,000,000 acres of dense forest in East Texas can support even a small population of large omnivores such as the sasquatch. After all, black bears no longer roam the Piney Woods of East Texas. 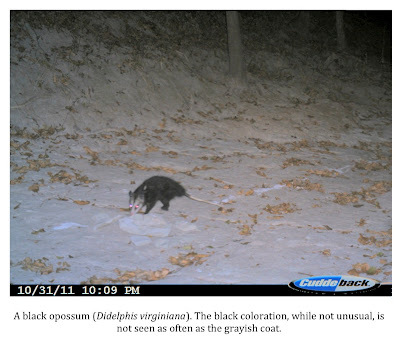 But did black bears disappear from East Texas because of a shortage of suitable habitat? No, or so says the Texas Parks and Wildlife Department. Biologists conducted a black bear habitat suitability study in four areas of East Texas: the Sulphur River Bottom (51,000 acres), the Big Thicket National Preserve (97,000 acres), the Middle Neches River Corridor (247,000 acres), and the Lower Neches River Corridor (312,000 acres). The purpose of the study was to determine the suitability of habitat in East Texas for the black bear, a large omnivorous mammal. The study is relevant because there may be a correlation between purported sasquatch and suitable black bear habitat. If an area is suitable for a large omnivore such as the black bear, it seems reasonable to posit that it is just as likely to be suitable for a small population of omnivorous sasquatches. One part of the study dealt with food availability in summer and winter; all four areas scored very high. Biologists calculated a strong favorable rating for the availability of protection and concealment cover in all four areas. In the category of human/bear conflict zones, a less than favorable rating for the Big Thicket National Preserve was determined, but a moderately to strongly favorable rating was found for the other three areas. Overall, the study indicated that the most suitable region for bears among the four study areas was the Middle Neches River Corridor, followed in order by the Lower Neches River Corridor, the Sulphur River Bottom, and the Big Thicket National Preserve. All four areas have had an abundance of bigfoot sighting reports. Environmental suitability issues were also addressed by another group of scientists. While the curators of Chimp Haven in Northwest Louisiana probably do not spend too much time contemplating black bear habitat factors, they do devote much of their time discussing and evaluating primate habitat. According to their web site, Chimp Haven provides a permanent home for chimpanzees (Pan troglodytes) retired from biomedical research, the entertainment industry, and those no longer wanted as pets. Their new sanctuary, presently under construction, is planned to accommodate 300 chimpanzees, animals which may be the closest relatives of sasquatches. Due to its ecology and climate, Chimp Haven curators believe that Northwest Louisiana is ideal primate habitat. 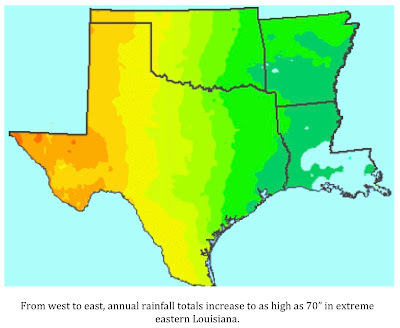 Western Louisiana and East Texas are virtually ecological clones. It should come as no surprise that Northwest Louisiana was selected as the new site of Chimp Haven’s operations, given what we believe about sasquatch habitat. In conclusion, several observations serve to dispel the notion that bigfoot sighting reports in Texas and Oklahoma are not the result of actual encounters. The reports, based on recent as well as older credible encounters, continue to accumulate and show no signs of abating. If one chooses to take the reports seriously and the apparent associated ecological patterns, as has been done in this paper, debates regarding the existence of this species are replaced by new issues such as those pertaining to ecology, distribution, behavior, and population densities. Alley, J. Robert (2003). Raincoast Sasquatch. 351 pp. Hancock House, Blaine, Washington. Bindernagel, J.A. (1998). North America's Great Ape: The Sasquatch. 270 pp. Beachcomber Books. Courtenay, B.C., Canada. Distribution of Precipitation in Oklahoma map. Provided by the online Web Atlas of Oklahoma. Fahrenbach, W.H. (1997-1998). Sasquatch: Size, Scaling, and Statistics. Cryptozoology Vol. 13: 47-75. Garner, Nathan P. and Sean Willis. (1997). Black Bear Habitat Suitability in East Texas, featured in Wildlife Research Highlights, pages 18-19 (.pdf). Texas Parks and Wildlife Department, Austin, Texas. Gould Ecoregions of Texas map (.pdf). Provided by Texas Parks and Wildlife Department GIS Lab. Green, J. (1978). Sasquatch: The Apes Among Us. 492 pp. Hancock House Publishers Ltd., Saanichton, B.C., Canada. Natural Regions of Texas map (.pdf). 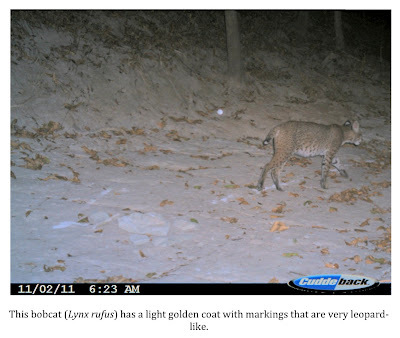 Provided by Texas Parks and Wildlife Department GIS Lab. Natural Subregions of Texas map (.pdf). Provided by Texas Parks and Wildlife Department GIS Lab. Oklahoma Ecoregions map. Provided by the online Web Atlas of Oklahoma. Population of Oklahoma map. Provided by the online Web Atlas of Oklahoma. Precipitation in Texas map (.pdf). Provided by Texas Parks and Wildlife Department GIS Lab. Surface Hydrography of Oklahoma map. Provided by the online Web Atlas of Oklahoma. Texas River Basins, Major Bays and Streams map (.pdf). 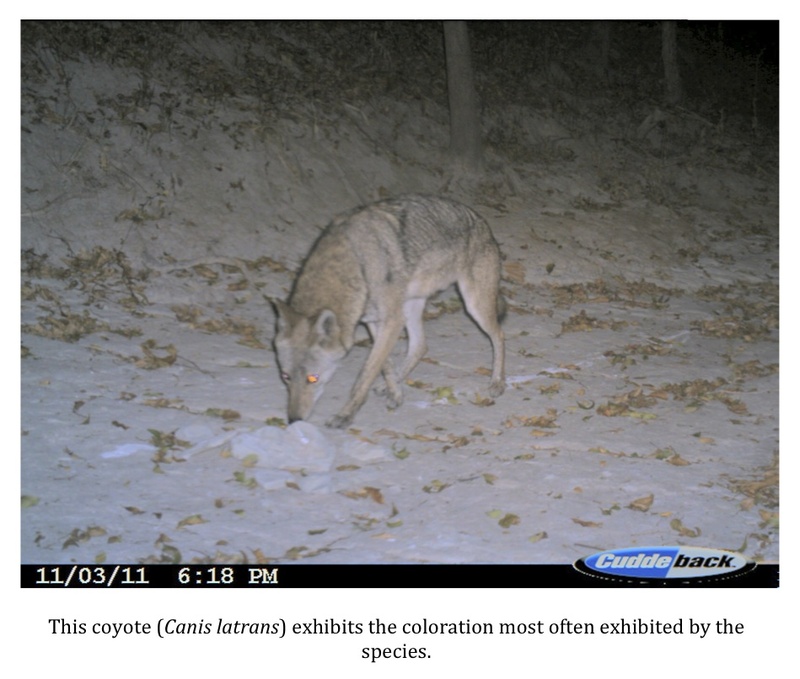 Provided by Texas Parks and Wildlife Department GIS Lab. Texas Sightings Database. TBRC Report Explorer. Texas Bigfoot Research Conservancy. The Vegetation Types of Texas map (.pdf). Provided by Texas Parks and Wildlife Department GIS Lab. Vegetation in Oklahoma map. Provided by the online Web Atlas of Oklahoma. Watersheds Across Oklahoma map. Provided by the online Web Atlas of Oklahoma. 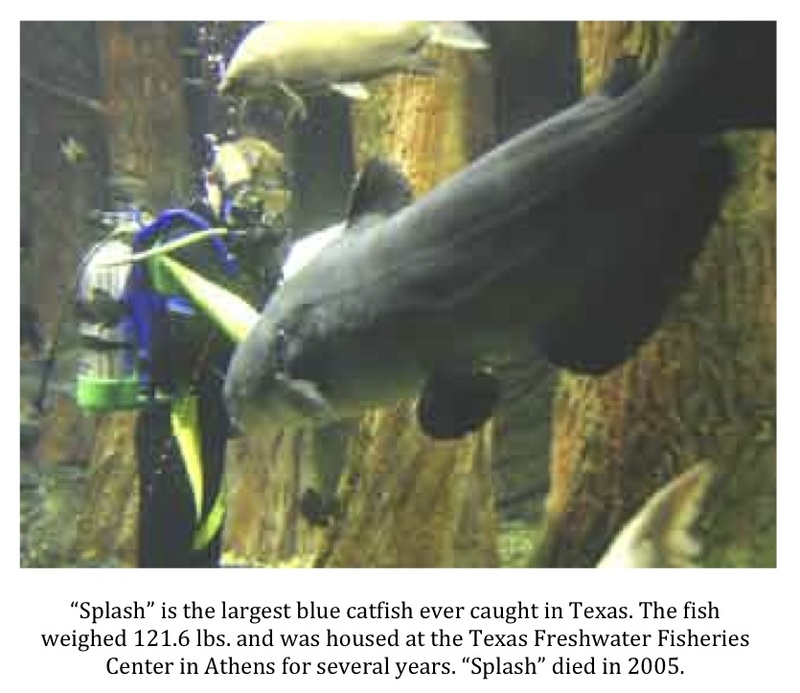 Tales of giant catfish patrolling the deepest waters of Texas lakes and reservoirs were very common in the area where I grew up. Even the occasional fisherman and/or outdoorsman in southeast Texas knew of these tales. Most of the stories from my youth centered around giant catfish that allegedly hung out near the dam of B.A. Steinhagen Reservoir in east Texas. The catfish of “Dam B,” as most called the lake, were said to be large enough to swallow a man whole. So intimidating were they, the story went, that several divers who had been sent down to inspect the dam refused to re-enter the lake once getting an eyeful of these beasts. If you missed the article you are in luck. The Port Arthur News has posted the 2005 article online. I don’t know how long it will be there so go check it out ASAP. You can access the article here. 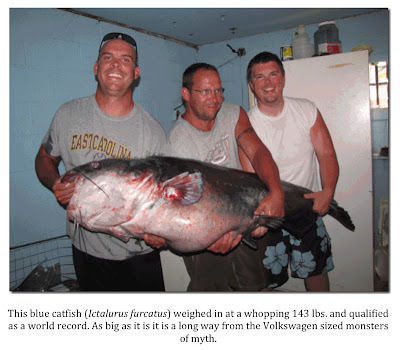 The stories of giant catfish continue to circulate to this day. I heard a rehashed version of the story I mentioned above just the other day. The only difference is that the giant fish had allegedly been seen in Lake Belton. Another factor in the recycling of these stories is a photo that has been making the rounds for years. The photo shows two men holding up a mammoth catfish. The version I received said the fish had been caught in Lake Texoma. The only problem is that the fish was a Wels catfish (Silurus glanis). This particular species is native to Europe and not North America. From what I can tell the photo is real. The story surrounding it is bogus. It is not unlike the story of the Brokenbow gar I wrote about a while back. It seems the stories of giant catfish will continue to live on whether the fish actually exist or not. I don’t know if these fish are real. If they do exist, their size has very likely been exaggerated. Even so, every time I’m tossing a crankbait along the rip-rap in the shadow of the Lake Belton Dam I think about what might be lurking in the deep water beneath me. It makes me smile every time. Those of you who have kept up with my camera-trapping project in Bell County, Texas may have noticed that I’m overdue on checking my cameras. As you can see from the schedule in the right margin of this page, the cameras were due to be checked on Saturday 12/3. 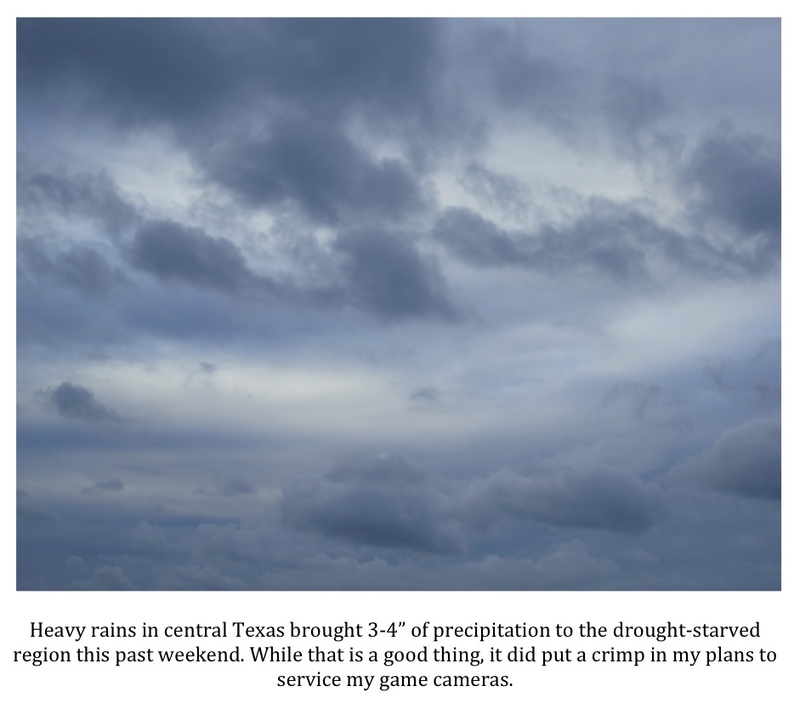 Due to what has become an increasingly rare weather anomaly here in Texas, several days of heavy rains, I had to put off checking the cameras this past weekend. Temperatures have ranged from the 30's to the 40’s, winds have been high, and, according to my rain gauge, we’ve received a little more than 4” of rain since last Friday. In addition, I’ve been flat on my back with a very nasty cold. The rainy weather is actually wonderful news for the drought-stricken part of central Texas in which I live so I didn’t really mind putting off the camera check for another few days. I’m sure the creek bed in which I’ve placed the cameras is full of water at the moment, which would make traveling from camera site to camera site difficult. All of this being the case, I decided this was a good weekend to stay inside and watch football. The plan now is to get out and service the cameras no later than this coming weekend. It is supposed to warm up some and the rain is going to stop. I’ll give the creek a couple of days to recede and then get on out there. I have had a report that one mountain lion has been seen in the vicinity within the last two weeks. The spot where the latest sighting allegedly took place is less than two miles from the camera location. I already know that multiple species are using this creek bed as a travel route. My hope is that eventually the mountain lion that continues to be reported will show up there as well. As always, I’ll post the latest pictures once I retrieve them. Most people who follow wildlife and ecological issues to any degree are familiar with the problems that invasive species are causing in various parts of North America. The plight of Florida officials fighting the exploding Burmese python populations in the Everglades is well documented. Other invasives are making headlines and causing major problems for native species as well. Zebra mussels, snakehead fish, feral hogs, and Asian carp are all causing problems to some degree in different regions of our nation. I’m willing to bet that one invasive species, that is causing major damage to the ecology of Texas, is not on the radar for most people. The invasive animal in question? The burro. 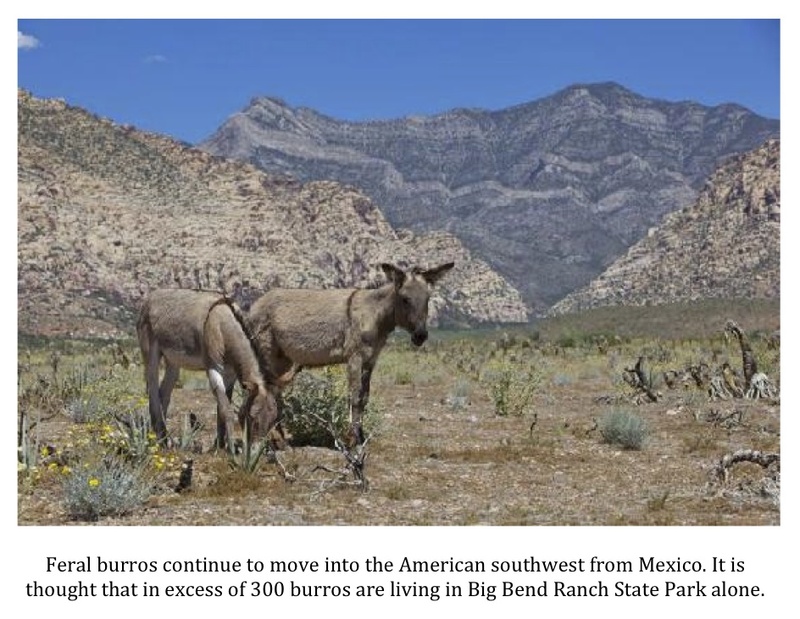 The burro (Equus asinus), which might best be described as a small, feral cousin to the donkey, is wreaking havoc on the ecology of far west Texas. Particularly hard hit is the Big Bend area the Lone Star State. 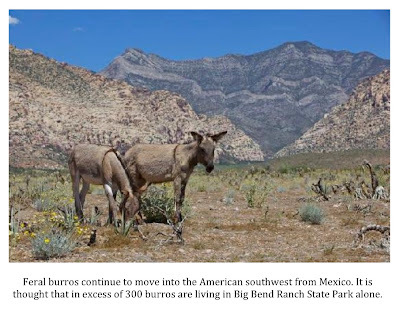 The burros are, and have been for some time, entering Texas from Mexico. The animals are aggressive and extremely territorial. Kevin Good, a special assistant with the Texas Parks & Wildlife Department says that the burros are commandeering watering holes and chasing other animals away from them. According to Good, they are also contaminating natural springs in the Big Bend area with their feces. The severe drought Texas is suffering makes each spring and watering hole vital. If native species are not able to drink due to aggressive burros or because the water has been contaminated they are going to suffer. Good says the burros are stressing native populations of black hawks, gophers, mule deer, and, especially, bighorn sheep. Bighorn sheep populations have plummeted in the last few years and officials are concerned that competition from burros could doom them in Texas. Sohatra Sarkar, professor of integrative biology at the University of Texas at Austin has spent years studying burro populations in Texas and Mexico. He agrees with the TP&WD that the burro population is out of control and poses a very real threat to the bighorn sheep population. The question then is what should be done about the problem? For the TP&WD the answer is simple. Eliminate them. To carry out this goal of eliminating the invasive burro population the TP&WD has taken to hunting them. Park rangers are combing the 300,000-acre Big Bend Ranch State Park, one of the state’s most rugged and isolated locales, with rifles in search of these burros. It is believed more than 300 burros are spread across this vast park. So far, park rangers have shot 128 of them. This approach is not allowed everywhere in the area, however. In neighboring Big Bend National Park the burros are protected by federal law. Here state officials are forced to try to round up and capture the burros. This is expensive and extremely difficult work. 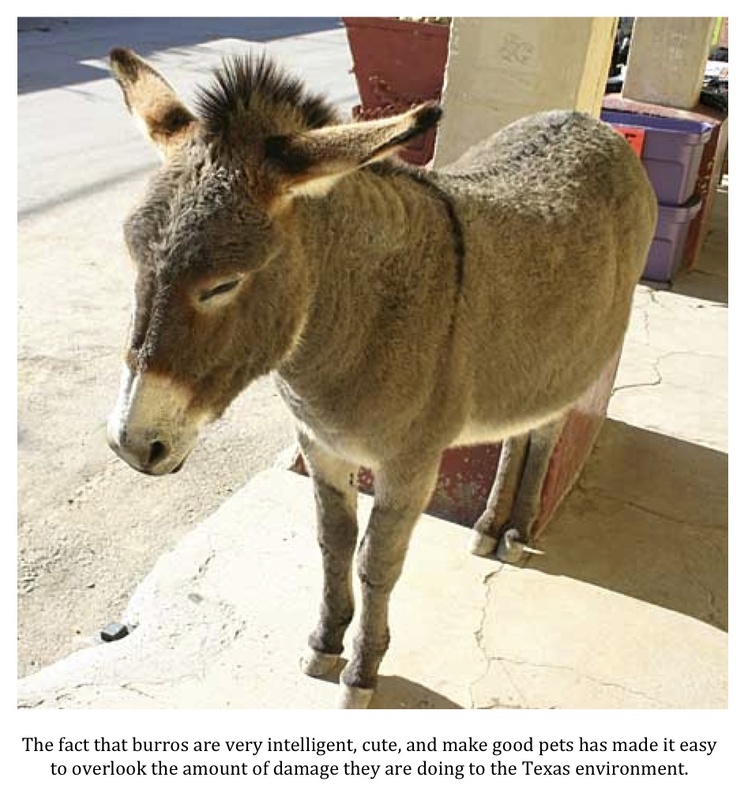 The burro is very intelligent and is adept at avoiding capture. Those that are corralled have to be screened for parasites and diseases and are then taken to auction. As would be expected in today’s world, the treatment the invasive burros are receiving is not sitting well with some. Animal rights groups are up in arms and some local residents remain firmly in the corner of the burros. Bumper stickers and placards showing support for the burros can be seen in and around Alpine, Texas and protests are beginning to get louder. Three dozen, or so, people attended a rally last month protesting the killing of burros in the region. Protesters sang songs and read burro-inspired poetry. They also suggested alternatives to shooting burros like darting and sterilizing them. The protesters did not seem to have any useful suggestions as to how to fund such a program, however. Adding to the situation is that burros are incredibly difficult to round up. The rugged terrain and the high level of intelligence of these animals conspire to make capture all but impossible in many instances. It is very simply one of those things that is easier said than done. To illustrate this point, Good recounts an effort made three years ago to corral the burros. A burro rescue group was hired by the state to go into Big Bend Ranch State Park and catch as many burros as possible. Despite their best efforts the group failed to catch a single animal. It really isn’t surprising that these burros would have some strong support. The animals are a living link to the past. The first burros and donkeys came over from Europe with the Spanish in the 16th century. The smaller burros quickly became the pack animal of choice for the arid and dry regions of the New World. The feral burros populating the southwest now are the descendents of the domesticated Spanish stock. The image of the grizzled old prospector leading his burro through rocky terrain is iconic. These burros are, in many ways, living history. I wonder if the problem isn’t more widespread than the TP&WD might suspect. Back in the spring of 2010, while on a trip to the Sam Houston National Forest, I heard a “donkey” braying early one morning. I was nowhere near a farm or any other sort of private property. 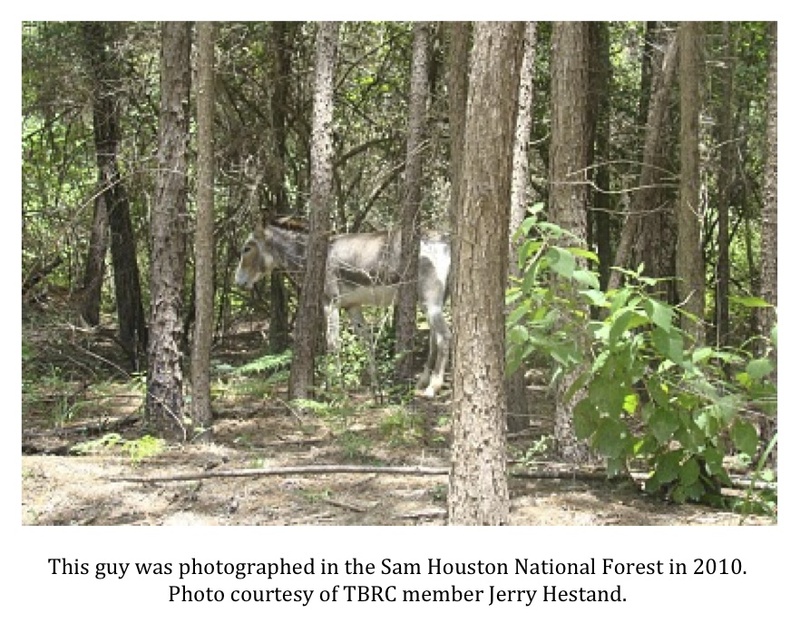 A group of my fellow TBRC members camped in the same location a couple of weeks later and not only heard the “donkey” but managed to get a photo of it. We surmised that this guy had escaped from a local and gone feral. I wonder now if he might not have been one of these burros that had somehow managed to make the trek into east Texas. The SHNF is certainly a long way from the Big Bend country but it makes me wonder. As unpleasant as it may sound to animal rights folks, the only real solution is to eliminate the invasive burros of west Texas. They are cuter than a feral hog or a snakehead but no less destructive. The native species of our state need to be protected from all invasives. It does not matter if that invasive is an ugly boar hog, a dangerous reptile like a Burmese python, or a fuzzy brown-eyed burro. Trapping, rounding up, and/or tranquilizing and sterilizing these burros is just not practical. The state simply has to, in my opinion, continue with their efforts to eliminate these invasive animals. Having said that, I also think that any rescue group or individual interested in trying to capture these burros should be allowed to do so free of charge. 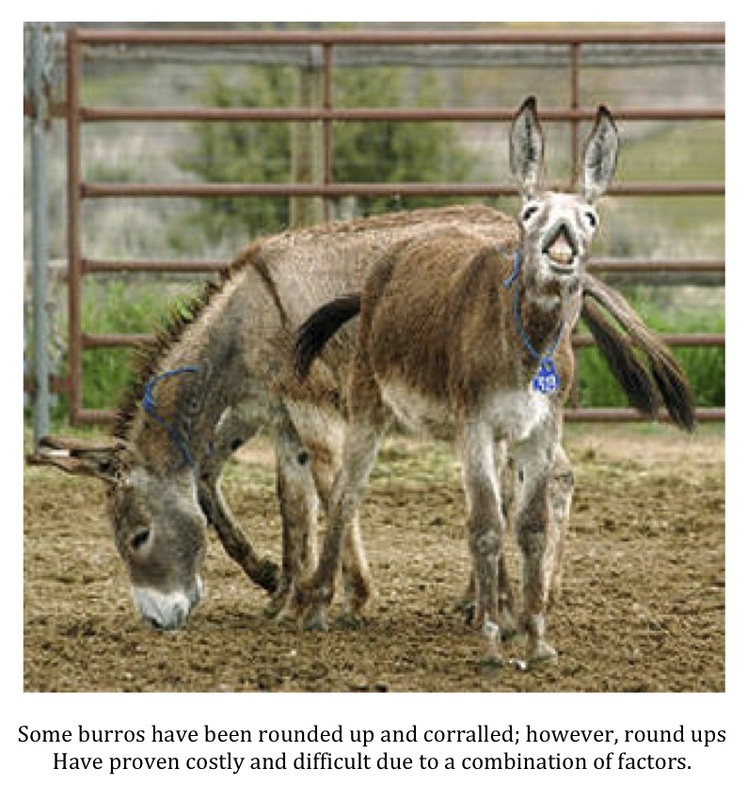 The TP&WD should make interested parties register with them, report where they will be attempting their round-ups, and inform them of how many, if any, burros were removed. This would involve little more than setting up a database on the part of the state and allow those who find the shooting of these burros abhorrent to put their money where their mouth is, so to speak. One thing is for sure. The problem cannot be ignored any longer. Source: Jervis, Rick (2011). Wild burros wreak havoc on Texas ecology. USA Today online. Sourced from here December 1, 2011.